When I first arrived in the House of Commons in 1997 I was impressed at the wide array of All Party Groups that had been established by MPs and Peers who shared common causes and who would come together to discuss, debate and raise issues of importance to their areas of interest. I was surprised, however, to discover that Britain’s most popular participative sport was not on the list – hardly a ringing endorsement of the impact of the national angling organisations that were around at the time. There was a House of Lords fly fishing club but after attending one rather stuffy dinner I came to the conclusion that this was never going to be the vehicle for getting angling higher up the political agenda. My problem was that there were strict rules about the membership of these All Party Groups with 20 nominees required from across the parties. Although I could easily round up ten Labour MPs from my own side, including several keen coarse anglers, I also needed anther ten from the combined opposition parties and there wasn’t anyone who seemed as keen as me to take this forward and to put in the work. Luckily all that changed in 2005 with the election of Charles Walker as Conservative MP for Broxbourne in Hertfordshire. Charles tracked me down within days of his election and soon we were arranging some fishing trips. I had the pleasure in helping him catch his first barbel and he helped me iron out some of the many flaws in my fly fishing technique. Charles was clearly a fine all round angler, a great orator and just the person to help get the All Party Parliamentary Angling Group off the ground. We were joined by my neighbouring MP Richard Benyon who represents Newbury whilst on the Labour side we had Mike Foster from Worcester who was an accomplished match fisherman and my old friend Jon Cruddas, the MP for Dagenham. 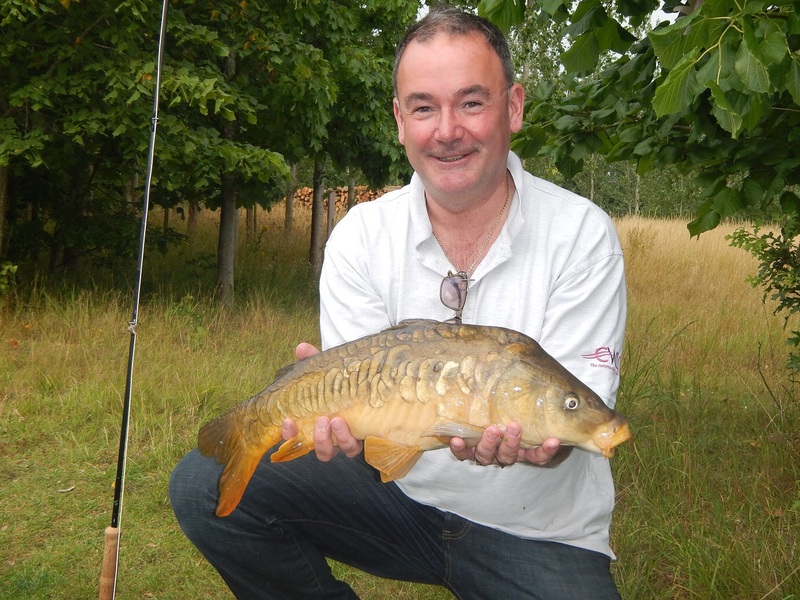 After I retired from the Commons in 2010 Charles took over from me as chair of the group and then passed the baton to another keen Conservative angler, George Hollingbery. George took the group from strength to strength and was instrumental in getting the government to press the EU to introduce new minimum landing sizes and other conservation measures to protect declining bass stocks. Having a group of like minded MPs from across the political spectrum has proved invaluable for the Angling Trust and has enabled us to have a real impact on policy which simply wasn’t happening in the past. 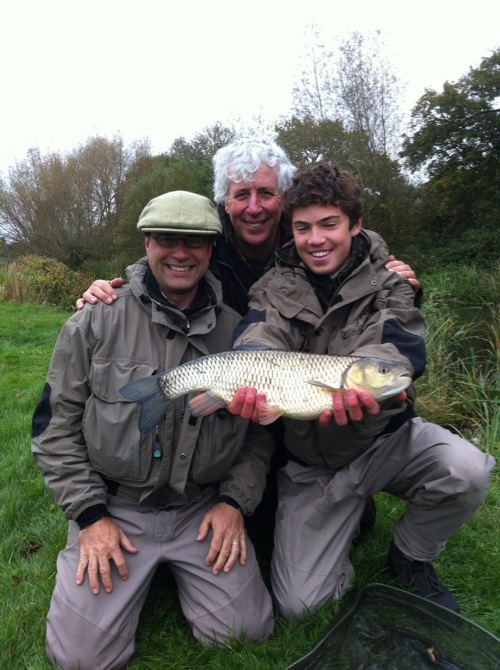 A nice four pound plus chub for Christian Hollingbery and his Dad George. And of course it’s not all meetings, debates and parliamentary questions. We actually went fishing as well. It was thanks to George Hollingbery that I caught my first salmon on the fly and I returned the favour by teaching George how to catch chub and grayling on the float. 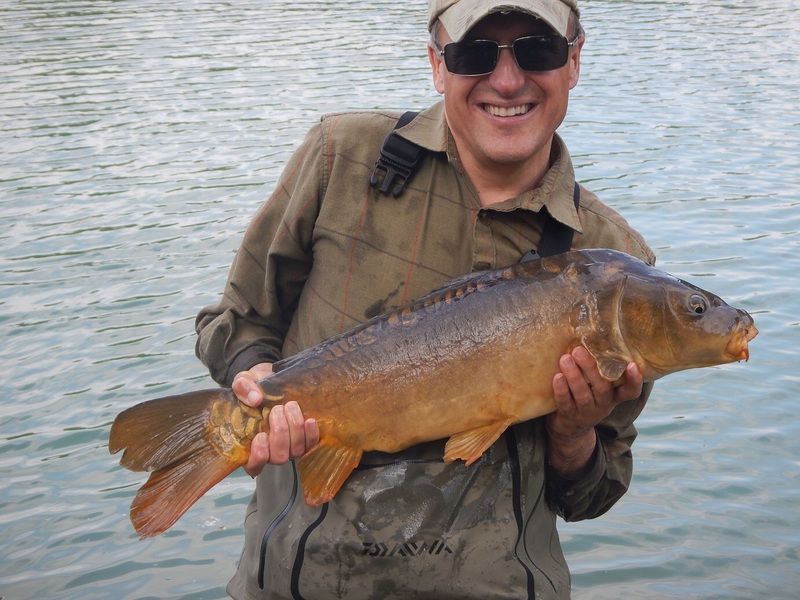 George has now been promoted to the government Whips Office which precludes him from involvement in our group but Charles Walker is back at the helm and very quickly got in touch with me after the general election to arrange an MPs fishing trip before the summer holidays. I suggested we link up with Brian Clarke, the angling writer for The Times who had been out with us before, and try something a bit different. We were to fish for trout in the morning and for carp on the fly in the afternoon. There were a couple of waters near my home in Berkshire that would be just the ticket and the arrangements were duly made. Our party was to be Walker, Cruddas, Clarke, Benyon and myself along with Owen Smith the Shadow Secretary of State for Wales. 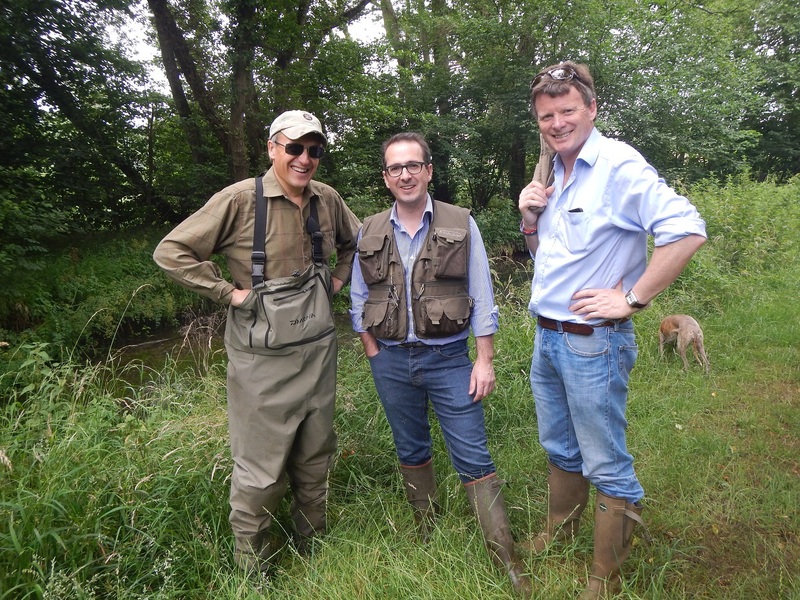 MPs Charles Walker, Owen Smith and Richard Benyon put political differences to one side as they search for trout on a low River Pang in Berkshire. We started on a lake near Theale and a few stocked trout succumbed to Charles while the rest of us struggled. Instead we decided to explore the nearby river Pang. 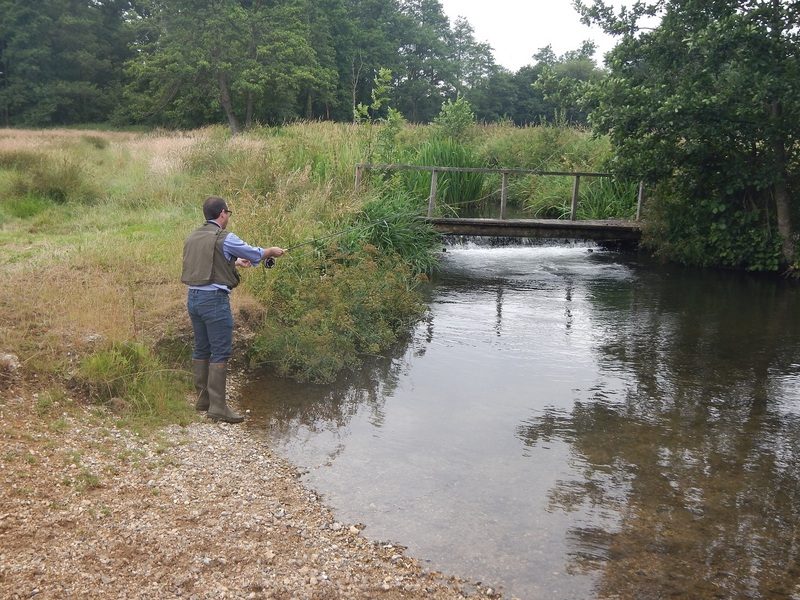 This tiny Berkshire chalk stream is a favourite of Richard’s and he was keen to see if we could tempt some wild fish before we stopped for lunch. Unfortunately the river was just too low to make fishing viable but I’m sure the guys will be back there once the flows pick up as the Pang holds some lovely grayling and some beautifully marked brownies. 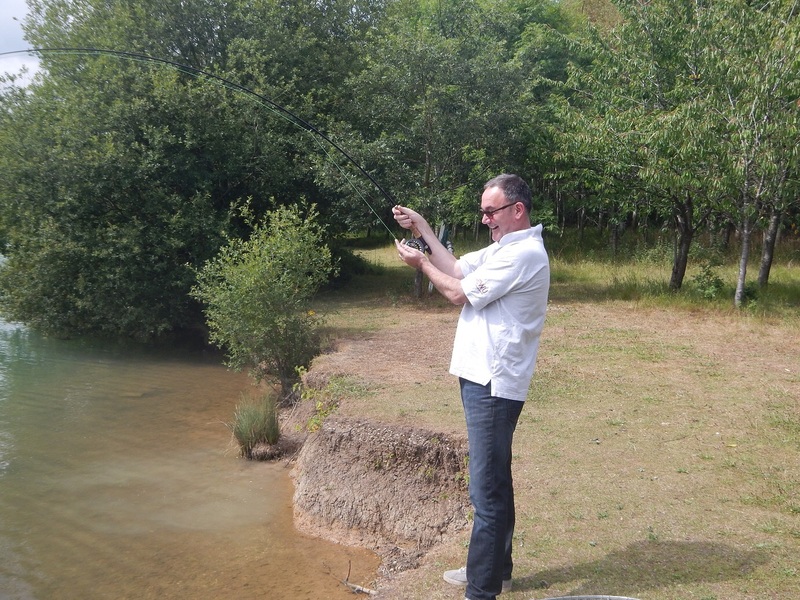 The trout weren’t playing ball on the Pang but Owen Smith couldn’t resist a cast or two in this pool. Richard Benyon very kindly laid on a nice lunch for us at Englefield House where the talk centred around the make up the new government and the campaign to become the next Labour Leader. Hardly anyone had attempted to catch carp on the fly before so I kitted them out with some deer hair dog biscuit imitations and a bag of Chum Mixers before leading a convey down to the lake where I hoped the carp would prove more cooperative than the trout had been earlier in the day. I needn’t have worried as the fish were almost as keen as the anglers. Charles Walker hooked up on one of a pod of fish that were nosing under the bank when we arrived. 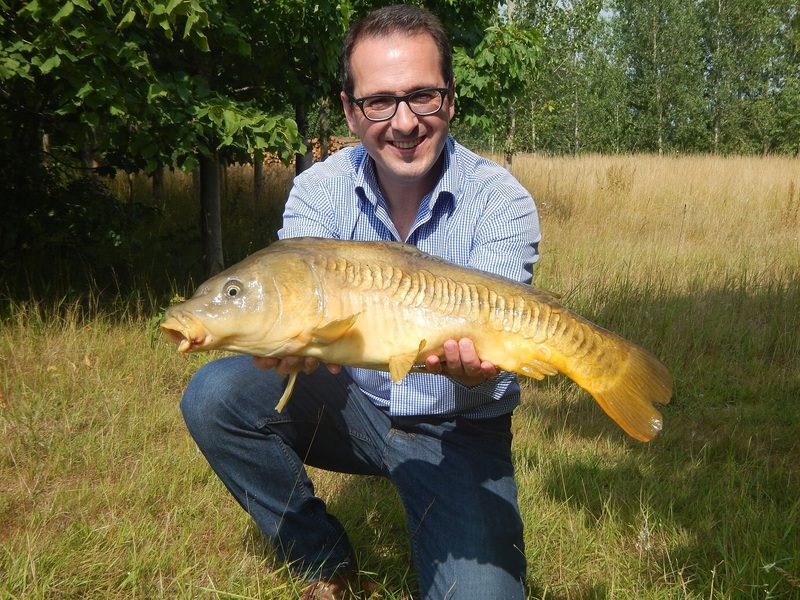 Shortly after both Jon Cruddas and Owen Smith were playing carp and enthusing about their fighting qualities. Best fish of the day went to Owen Smith who has become a carp convert. Although the fish inevitably became more wary after a few had been landed most people were enjoying plenty of action. Funnily enough, although Brian Clarke was undoubtedly the most accomplished fly angler of us all it was he who was having most trouble converting his takes into fish on the bank. Sometimes this happens in fishing and it takes longer for the expert in one discipline to get into the zone for another species or technique. Brian is not only skillfull, he is persistent as well. I persuaded him to move to a spot where the fish looked a little less spooky and sure enough his reel was soon singing as a Berkshire carp headed for the horizon. 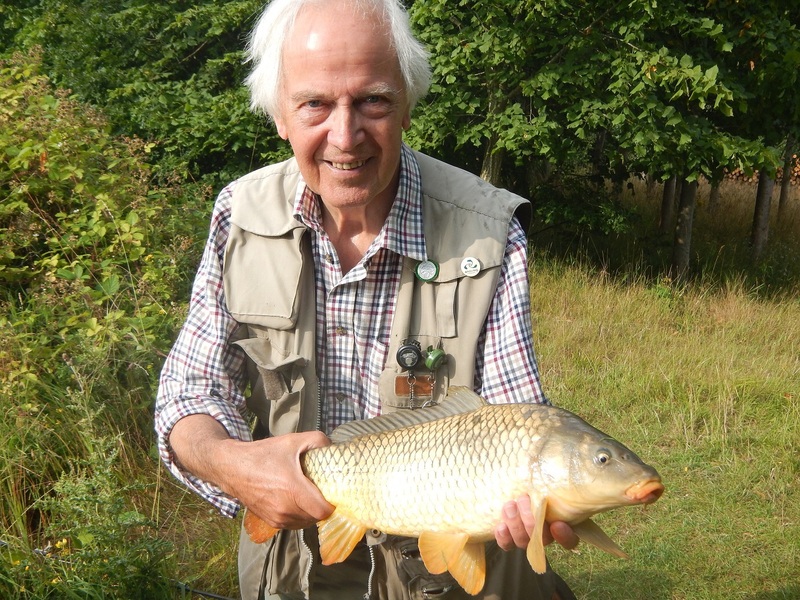 Fly fishing legend Brian Clarke with a well earned fly caught carp. With Parliament now in recess I guess the next time I hook up with our parliamentary supporters will be at the various party conferences in the autumn. But the great thing about having these strong angling relationships is that if anything happens that needs political intervention we know that there are a group of MPs who are only too happy to wade in on our behalf.